It’s called the UniverCity Year program, but it’s really an extension of the Wisconsin Idea. On May 3, students, faculty and community members gathered at the Lake Mendota Room inside Dejope Hall to celebrate the yearlong partnership between the city of Monona and the University of Wisconsin–Madison. The program pairs academic courses, faculty, staff and students with projects identified by the community. Monona, a city of about 7,500 just outside Madison, was the first community to participate. “It aligned perfectly with our mission to move knowledge and discoveries off the campus and into the real world,” said Charles Hoslet, vice chancellor for University Relations. A students’ conceptual design for Monona’s Winnequah Park, done as part of UniverCity Year. The program is modeled on an initiative at the University of Oregon that has been adopted by a number of other universities. Twenty-three UW–Madison classes participated, working on 30 projects. Monona identified four project areas to work on: parks and recreation, housing and economic development, “Connected Monona” and active transportation. Students, faculty and staff worked on the projects through courses as well as individual projects. 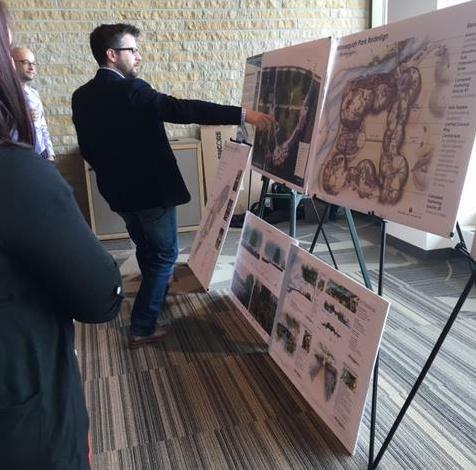 “We tackled projects the city of Monona had dreamed about and drew up plans for better housing, transportation, communications and for restoring and renewing some of Monona’s most precious resources — places like Ahuska Park,” Hoslet said. UW System President Ray Cross called UniverCity Year the second iteration of the Wisconsin Idea and looks forward to seeing the program expand throughout the state. By strengthening the relationship between UW and communities, solutions can be found while giving students experience outside of the classroom, Cross said. “I have always felt the university needs to examine more problems, because creativity and innovation almost always are spawned through the study of problems,” Cross said. Students in Life Science Communications produced service announcements on a variety of topics to air on WVMO, 98.7 FM, the Voice of Monona radio station. Subjects covered bike safety and promoting the Monona Senior Center and Monona Library, which can be heard here. 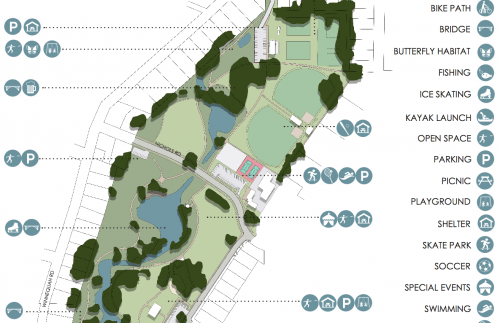 They also researched and recommended improvements to the master plans for Ahuska and Winnequah parks, focusing on increasing the usability of the parks, including improvements to lighting, pedestrian paths, sports fields, and restroom facilities. They also investigated sustainable environmental management improvements like irrigation, drainage, landscaping, shoreline restoration and turf management. “I’ve always gone for real-life projects instead of thought-up projects,” Landgraf said. Students examined the current housing climate in Monona to inform redevelopment goals and select sites for redevelopment. They were able to meet with planning directors and city administrators to share their ideas. Jessie Conaway, faculty associate for Native Nations Partnerships, had her Environmental Studies Capstone course partner with Monona Parks & Recreation and Ho-Chunk Nation Tribal Preservation. Projects centered around cultural research education and stewardship, including providing cultural resources in parks to educate elementary students. Jason Vargo, an assistant scientist with the Nelson Institute and the Global Health Institute, leads the UniverCity Year initiative. UniverCity Year is a member of the Educational Partnerships for Innovation in Communities Network, which Vargo currently chairs. Following the success of the Monona partnership, the program will next work with the Dane County Board of Supervisors (made up of 37 elected representatives), the county’s legislative and policy-making body. The Dane County partnership will begin in fall and include projects focused on sustainability and equity, which gives UniverCity Year the opportunity to include other disciplines like law, social work, nursing and public health, Vargo said. Proposals are now being accepted from communities interested in partnering with UniverCity Year during the 2018 calendar year. Request for Proposals are due June 30, 2017. For more information, visit the UniverCity Year website at https://univercity.wisc.edu or email univercityalliance@wisc.edu.